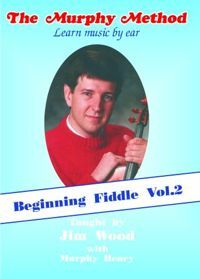 Beginning Fiddle Volume 2: Wanting to play bluegrass? Wanting to jam? Well, you’ll need to learn something other than fiddle tunes. Especially when you start playing with other people. These six songs from the traditional bluegrass repertoire are likely to show up at any bluegrass gathering. We also introduce the idea of fiddle backup so you can support the other musicians (and stay out of their way!). As always, everything is explained clearly, note by note. Now you can play along with your banjo-picking buddies. And when someone calls for “Foggy Mountain Breakdown,” you can take a solo! No Tab.